Misadventure in the Middle East is a story of a journey around the Middle East or, as our two intrepid heros would prefer, The Heart of the Islamic World. They are painters who venture forth with no great political or religious ideals and so were open to everything that this adventure was to offer. Henry Hemming and his companion Al are presented with unexpected difficulties near the start of the trip. Not as you might expect from indoctrinated, religiously over-enthused border guards in Iran. No, the problem starts with Eastern European border guards in Slovakia who refuse entry to the two bohemians (in lifestyle not nationality). The grounds for that refusal? They are obviously Islamic extremists bent on riot or civil unrest. Well, one of the lads had a beard and the other had a dangerous tent pole but neither are Muslims. Henry and Al had recently met some young Muslims in the Czech Republic who had described the changes to their lives since 9/11. They only fly, these days, as a last resort because fellow passengers are uneasy travelling with those who look so obviously Islamic. 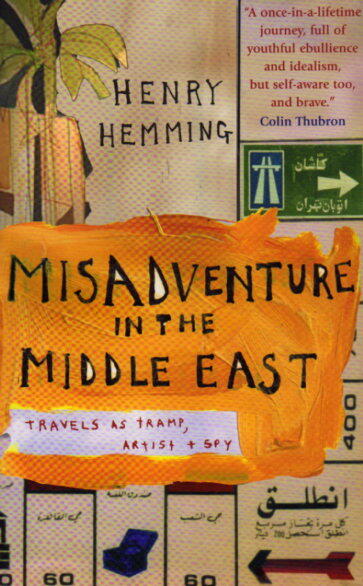 Misadventure in the Middle East isn’t the usual holiday romp. These guys are artists who are youthful and naive. They are exposed to Iranian skiers who keep out the cold with slugs of alcohol and drugs. They are targeted by Hungarian criminals. They view torture chambers, secret beaches and artists studios, but most importantly they have the rare opportunity to interact with the locals. If you want a travel book about real people, current attitudes and hopes, then Misadventure in the Middle East is the volume for you. It isn’t a book of romantic rug sellers, shopping opportunities and smart restaurants. Henry and Al don’t point you in the direction of the best hotels. This is a book for those travellers who “want to know”. It’s gripping and thought-provoking and a thoroughly good read.